Rope walking is the art of walking, dancing and performing feats of equilibrium on a rope or wire stretched between two supports. It has been popular with most Asiatic and European peoples from the beginning of history. Before the middle of the 10th century, a rope was invariably used and was stretched as tightly as possible. Thusly, the art was called Tight-rope Walking. About the year 1875 the slack wire, stretched loosely from support to support, was introduced, and is now more commonly used. The performer is often aided in keeping his balance by a Chinese umbrella or a long pole. The beautiful thing about a rope walkers is their inner balance. 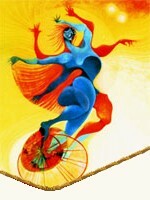 Both tight and loose rope walkers must possess this very essence of an acrobat. 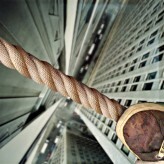 The higher the wire, the more the presence of danger is perceived. The more danger, the more entertaining it is. Acrobats have ended up hundreds of feet above roaring rivers and vast gorges. These types of buskers usually incorporate amazing feats while up on the higher wire. Whether it's juggling or balancing on a unicycle or even both, it is quite an accomplishment while at the same time keeping in perfect balance. Best left to the pros, these ariel performers have practiced thousands of hours perfecting their art.